This is an ideal opportunity for someone to learn first-hand about wolfdogs, including behavior, containment, legal and political issues. As a caretaker, you will be responsible for daily feeding, watering and cleaning pens, and you’ll learn the fine art of fencebuilding. As an ambassador, you’ll be able to pass on what you’ve learned to the public during outreaches and events. You'll get to know the residents here, from friendly wolfdogs who soak up attention and would love to be walked and groomed, to wolfdogs who just need someone to show them that humans aren’t always scary monsters. This opportunity requires a minimum commitment of two months, five days a week. We do not offer a stipend, but there is housing on the property, which consists of a travel trailer with kitchenette and refrigerator, as well as separate phone line for local calls and internet. Full Moon Farm is a 35-minute, scenic drive away from the town of Black Mountain, and another 20 minutes gets you to artsy, progressive Asheville. 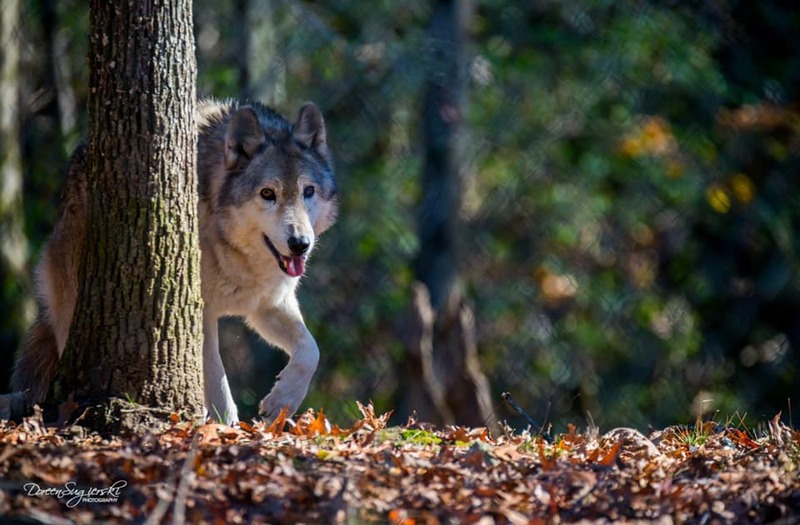 Whether you are in school and working toward academic credit, or just have a desire to work with and learn about wolfdogs, we welcome your application. You must be 18 or older, have a valid driver’s license and proof of medical insurance, and be able to work independently. For more information and to apply, please contact us at info@fullmoonfarm.org or volunteer@fullmoonfarm.org.